‘Tis the season to watch a whole load of Christmas movies while stuffing your face with gingerbread. Luckily, Netflix is releasing its own Xmas films in a never-ending stream. 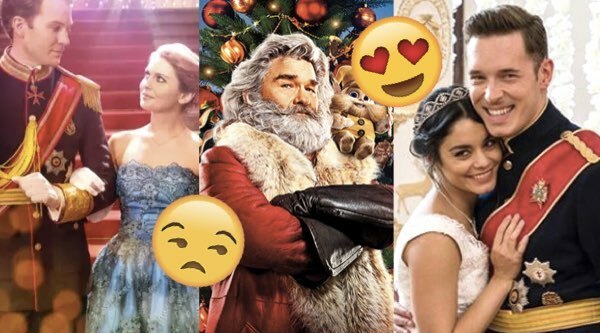 Since Netflix Christmas movies have become a genre of their own – following the bonkers success of last year’s A Christmas Prince – we decided to watch them all and rank accordingly. It takes a certain twisted individual to watch so many Xmas movies without going a little insane. I’m not going to confirm or deny that I needed alcohol to get through some of these. What is this filth? Where are the reindeers? Where are the Xmas trees strategically placed in every shot? Where’s the motherfukin’ Christmas spirit?!? It’s actual blasphemy to even allow the word ‘Christmas’ in the title for this film. It’s just a rather dull cowboy crime spree and tbh, I only got through the first half even after a whole glass of gin. The follow up to the iconic bad Xmas movie to end all bad Xmas movies A Christmas Prince — I really had high hopes for this one. How could they have gotten it so wrong? Firstly, they took it all way too seriously. Secondly, I just really DGAF about the workers’ rights in an imaginary village. What a mess. Pro tip: watch when you want to get to sleep real fast, it works surprisingly well. I reviewed this movie last year, but had absolutely no recollection of it, so that’s not a good start. The gist of it is that some self-entitled party girl gets taught a lesson by being sent to a place called Snow Falls and *gasps! * she discovers the true meaning of Christmas. It’s definitely watchable but I wouldn’t advise. This Christmas Chronicles was much better than I expected. It also stars actual actors that I’ve heard of so that’s a refreshing departure from the rest of Netflix’s Chrissy flicks. It stars Kurt Russell as a rather hot Santa (aka Xmas Daddy) who ends up enlisting the help of two children after they sneak into his sleigh. It’s a bit too wholesome for my liking but ideal for families or Christmas film traditionalists. This movie is the best Christmas movie that is not remotely about Christmas. Like seriously, it’s a bloody stretch to be releasing this film in December. Saying that, I loved it in all its terribleness. I can’t wait to watch it again. Stay tuned for my review coming soon. This was one of the first Christmas movies to drop on Netflix this year and it’s one of the best. It’s not a totally original story but the lead Kat Graham (from The Vampire Diaries) is incredibly charismatic and the love story is so dumb it’s almost art. Oh, and there’s a magical calendar that predicts the future, so that’s pretty neato. I must pay respect to the movie that kickstarted this whole bad Christmas movie craze back in 2017. It really is the most nonsensical film ever made, it’s so bad and confusing you just can’t look away. Like a beautiful, sparkling car crash covered in tinsel. I still forget what the Prince looks like every second he’s not on screen. That’s an impressive feat IMHO. What. A. Movie. Vanessa Hudgens plays two versions of herself, one as a bakery owner from Chicago, the other the Duchess of Montenaro. Need I say more? This movie is iconic and I plan on watching it at least 18 more times before Christmas and probably with a hangover on Boxing Day.